If you're like us, probably the first thing you think of when you hear, "Girl Scouts" is cookies. That's because the Girl Scouts, who celebrated their 100th Anniversary in 2012, have been selling cookies for almost that long. The Girls Scouts of the United States of America was founded in 1912 in Savannah, Georgia, by Juliette Gordon Low (aka "Daisy") with the help of the founder of the Boy Scouts of America, Sir Robert Baden-Powell. The Girl Scouts grew out of the Girl Guides which were first formed in Scotland in 1911. The organization's name was officially changed from Girl Guides to Girl Scouts in 1915 and by 1916, the group quickly surpassed 7,000 members. Some famous Girl Scout Alumnae include: Hillary Clinton, Oprah Winfrey, Ann Landers, Lucille Ball, Mariah Carey, Whoopi Goldberg, Halle Berry, Martha Stewart, Condoleezza Rice, Kate Winslet, Gwyneth Paltrow, Dorothy Hamill, Barbara Walters, Sandra Day O'Connor, Gloria Steinem, Sheryl Crow, Taylor Swift, Sally Ride, Katie Couric, Madeleine Albright, Dionne Warwick and Peggy Fleming. The selling of cookies to finance troop activities began back in 1917, with the sale of home baked cookies in high school cafeterias. In 1922, an article and cookie recipe was published by Girl Scout national headquarters and provided to more than 2,000 Girl Scouts, estimating that six to seven dozen cookies could be made for about $0.30 cents and then sold for $0.25 to $0.30 cents per dozen! In the 1920s and 1930s, Girl Scouts from around the country continued to bake their own simple sugar cookies with their mothers. These cookies were packaged in wax paper bags, sealed with a sticker, and sold door to door for $0.25 to $0.35 cents per dozen. Add well-beaten eggs, then milk, vanilla, flour, salt and baking powder until well mixed. Roll out the dough and cut with a Trefoil Cookie Cutter (sprinkle sugar on top, if desired). Bake for 8 to 10 minutes, or until edges turn golden brown. This recipe makes about 6- to 7-dozen Early Girl Scouts Cookies. In 1934, the Greater Philadelphia area became the first Girl Scout council to sell commercially baked cookies. Two years later, in 1936, Girl Scout Cookie sales went national when the national Girl Scouts licensed the first commercial baker. Enthusiasm for Girl Scout Cookies quickly spread nationwide. In 1937, more than 125 Girl Scout councils reported holding cookie sales. Annual cookie sales continued, with the national organization licensing local bakers to produce and package the cookies sold by girls in councils. By 1948, a total of 29 bakers throughout the nation were licensed to bake Girl Scout Cookies! 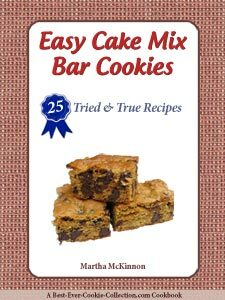 During World War II, when sugar, flour, and butter shortages were common, making cookies was expensive and ingredients were scarce. So, Girl Scouts also began selling Girl Scout calendars to raise money for their activities. Some bakers also offered an optional flavor. In 1960, licensed bakers first began wrapping the Girl Scout Cookie boxes in printed aluminum foil, or cellophane, to protect the cookies and preserve their freshness. Cookie sale volume increased significantly in the 1960s. By 1961, 14 licensed bakers were baking thousands and thousands of Girl Scout Cookies annually. By 1966, a number of varieties were available, with the best sellers being Chocolate Mint, Shortbread, and Peanut Butter Sandwich cookies. In 1978, the number of bakeries was decreased to four to ensure uniform quality, packaging, and distribution and lower prices. 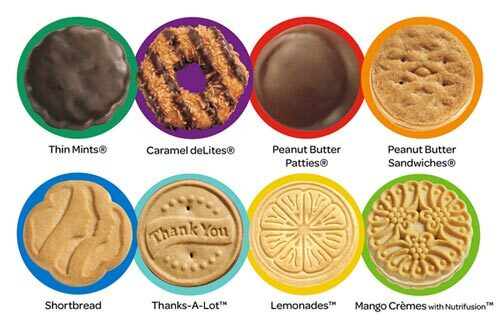 Girl Scouts of the USA, began supplying the licensed bakers with standard cookie package layouts and pictures. 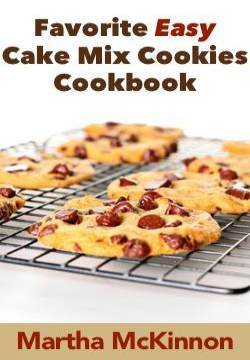 As of 2012, two licensed bakers (Little Brownie Bakers and ABC Bakers) produce a maximum of eight varieties, including three mandatory ones (Thin Mint, Peanut Butter Sandwich, and Shortbread) and five optional. All these cookies are kosher. Where Are Girl Scout Cookies Sold? Girl Scout Cookies can only be purchased from Girls during the official cookie season, which is usually between January and April, though some occur in September. To find cookies and learn when cooki season starts in your community, you can visit www.GirlScoutCookies.org and use the zip code locator to learn when cookies go on sale and where booth sales may be located in your neighborhood. They also have a free mobile Cookie Finder App for your iPhone®. You can search for sales in your neighborhood, get details on your favorite Girl Scout cookies and find your own Cookie Personality! Mark your calendar for National Girl Scout Cookie Day which falls on February 8th. 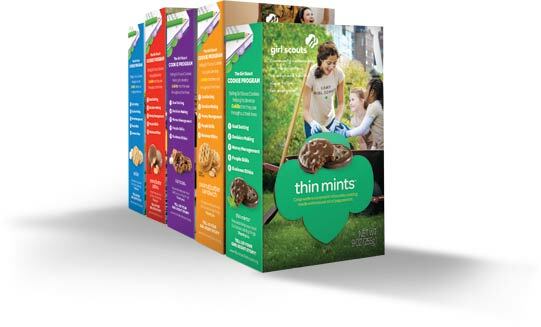 Licenses bakers can offer up to eight varieties of Girl Scout Cookies, but only three types are mandatory: Thin Mints®, Peanut Butter Sandwich/Do-Si-Do's® and Shortbread/Trefoils®. The national Girl Scout organization reviews and approves all varieties proposed by the bakers. Any of the five optional cookies can be changed every year. 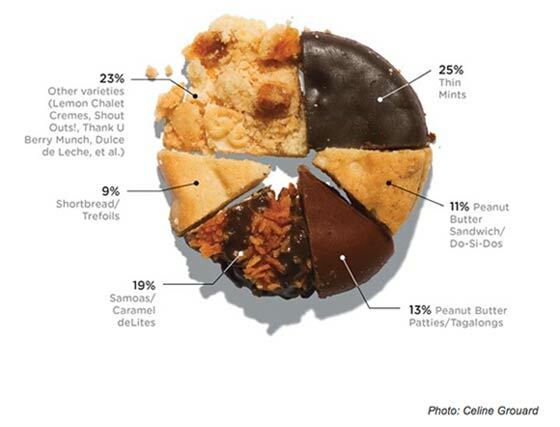 Each bakery names its own cookies, so Girl Scout Cookies that are quite similar may have different names. That's why the varieties differ by year and location. To see a listing of all current varieties of Girl Scout Cookies along with pictures and descriptions, you can visit www.GirlScoutCookies.org. All the other varieties combined account for the remaining 23%. Thin Mints, which were introduced in the 1930s, are the most popular Girl Scout cookie as well as the 3rd best selling cookie in the United States! Delicate vanilla cookies drenched in caramel, sprinkled with toasted coconut and laced with cocoa stripes. Number 2 Bestseller. Deliciously smooth peanut butter sandwiched between crunchy oatmeal cookies and long time favorite Girl Scout cookie flavor. Inspired by the classic confections of Latin America, these sweet, bite-size cookies are rich with milk caramel chips. Savory slices of shortbread with a refreshingly tangy lemon icing. Delicious vanilla and coocnut cookies filled with a tangy mango-flavored crème enhanced with nutrifusion (nutrients derived from fruits). Savannah Smiles are crisp, zesty lemony cookies named in honor of the 100th anniversary of Girl Scouting. Crispy vanilla cookies layered with real peanut butter and blanketed with a chocolaty coating - another favorite flavor. Heart-warming shortbread cookies dipped in rich fudge and topped with an embossed Thank You message in one of five languages. Real, premium cranberries provide a delightful tartness in these hearty cookies sweetened with creamy, white fudge chips. Thin chocolate wafers dipped in a rich chocolaty coating with a burst of pure peppermint. A longtime bestseller. Traditional favorite with a buttery, light flavor. All Abouts: Shortbread cookie dipped in chocolate with a message proclaiming values that Girl Scouts are "all about," such as Respect, Friendship, etc. Aloha Chips: Included white chocolate chips and macadamia nuts. Retired early 2000s. Apple Cinnamons: Apple shaped sugar cookies with cinnamon sprinkles. Cafe Cookies: Shortbread with a crunchy cinnamon topping. Cartwheels: Reduced fat oatmeal and cinnamon cookies. Cinna-spins: Cinnamon-flavored cookies shaped to look like miniature cinnamon rolls; came in 100-calorie packs. Retired in 2009. What Happens to Unsold Boxes of Girl Scout Cookies? This is a great article from NPR that discusses the addiction some people have with finding fun, tasty and creative ways to incorporate Girl Scout Cookies into their kitchen creations. 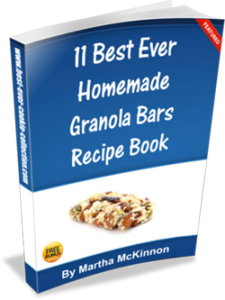 Get recipes for Girl Scout Lemon Fish, Aren't You Glad You Didn't Give Up Carbs Girl Scout Cookie Stuffing, Thin Mints Popcorn, Must Be 21 Girl Scout Bourbon Balls, Girl Scout Cookie Dessert Pizza and Gone To Heaven Girl Scout Cookies. Stacy Calles, chef de cuisine at Emeril's Chop House - and a former Girl Scout herself - shares her GS Cookie dessert recipes with modified versions for home bakers. Her delicious recipes include: Lemonade Crème, Girl Scouts Peanut Butter Sandwich, Mascarpone Bombe, Thin Mint "Shake", and Coconut Cream Pie.